Defenseman Mike Green will be the best free agent option available on defense when NHL free agency gets underway on July 1st at noon. He made just over six million dollars a year for the Washington Capitals over the past few seasons and posted the highest point total (45) this past campaign since his ridiculous 76 point season five years prior in 2009-10. The Washington Capitals had a successful 2014-15 season under first-year Caps head coach Barry Trotz. Their offseason list is full of important tasks including the signing of goaltender Braden Holtby to a long-term extension, RFA contracts of Marcus Johansson and Evgeny Kuznetsov along with filling out the bottom six forwards and the third pairing on defense. Like any negotiations, any player can be had for the right price. The Capitals should aim to do this with Mike Green as well, but the market will dictate what Green should receive. Washington GM Brian MacLellan will need to make a decision on whether to wait on one of the team’s top defensemen in team history or sign a cheaper option to begin free agency and move on immediately. Green played his first full NHL season in 2006-07 and has been a valuable contributor to the Capitals franchise since. He ranks seventh in points (357) since 2006-07, behind top defensemen including Duncan Keith (394), Shea Weber (382), Dan Boyle (377), Mark Streit (373), Brian Campbell (371) and Zdeno Chara (363). Health has limited Green’s chances of becoming the top point accumulator during that time frame, but he has averaged .65 points per game since the 2006-07 campaign. If Brian MacLellan were to keep Mike Green, Washington would still hold a valuable offensive blue liner and a key part of the power play, one of the best man advantage units in the league. Beyond Green, the options are slim in free agency and include older players such as Lubomir Visnovsky, Paul Martin, Sergei Gonchar. Washington currently has five defensemen signed for the 2015-16 campaign: Matt Niskanen (5.75 million through 2020-21), Brooks Orpik (5.5 million through 2018-19), John Carlson (3.966 million through 2017-18), Karl Alzner (2.8 million through 2016-17) and Dmitry Orlov (2 million, RFA in 2016-17). The addition of Green would round out their starting six on defense and provides Trotz the ability to roll out three solid pairs every game. Washington should move on from UFA’s Tom Gleason and John Erskine, both are aging defensemen who don’t contribute much in today’s NHL. Another benefit of keeping Green is added leadership in the locker room. Much was made of Washington’s newly defined team culture and chemistry under Trotz and it can’t be understated. There was a greater sense of accountability with Trotz than former Caps coach Adam Oates and it had to play some role in Washington’s success this past season, both on and off the ice. Since Green is the top free agent available from the blue line, he will be paid accordingly. Unless he ignores the additional cash to stay in the nation’s capital, Green will likely find a long-term deal that could be his final contract in hockey. Teams can go up to a seven-year deal in free agency now and that isn’t out of the question when a player is the best at their position in the open market. Green is a capable top four defensemen and those are hard to find in free agency. Teams more often only find elite puck movers through the draft or having to move other top players at one position to find elite talent at another position. Alzner on Mike Green: "I think he'll be a guy that's remembered in Washington forever." Keeping Green also removes flexibility from Washington’s defense. A long-term signing of Green would give the Capitals four defensemen locked up though at least the 2017-18 campaign. Washington has a significant number of young defensive prospects that should be able to contribute in the near future including Orlov, Nate Schmidt, Connor Carrick and Madison Bowey. No NHL team should be spending close to six million dollars on a defenseman on their bottom pairing. There are cheaper options available rather than hurting your long-term future even more on defense. The signing of Green following Brooks Orpik last summer could put Washington into a deeper hole down the road. Washington should move on from Green, there could be cheaper options available, most importantly on shorter deals. The Capitals could always just play a composition of Orlov, Schmidt, Carrick or potentially Bowey on their last pair and add a veteran or two as insurance. The free agent options Washington should consider include Johnny Oduya, Brett Bellemore and Adam McQuaid. All of these players could potentially receive shorter deals and Bellemore and McQuaid are younger options that could benefit Washington in the future if they can sign them to a good deal. Oduya was originally drafted by Washington and has played for a winner like Chicago and would be a solid get to round out their defense. McQuaid and Bellemore are both physical blue liners that could benefit Washington on their third pairing. McQuaid is just 28 years old and could move on from the Boston Bruins because of their tightened salary flexibility. He will never provide any offense from the blue line or move the puck up the ice at an elite level, but could help Washington’s penalty kill along with giving them three right-handed defensemen, one for each pairing, always beneficial for a defense. Bellemore recently broke into the NHL and has seen his first significant action over the past two seasons. 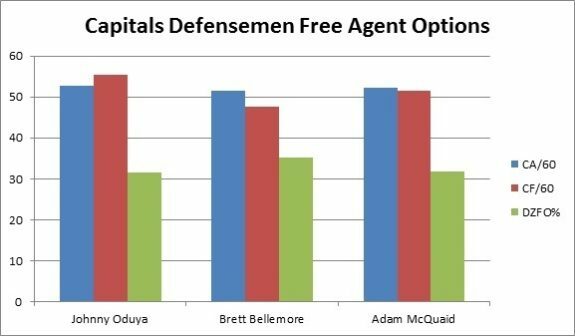 Like McQuaid discussed above, Bellemore is a physical force that doesn’t provide much offense, but is a reliable option for the last pairing on a defense with some room for growth through development with the Washington coaching staff. He’s compiled 20 points in 121 career games following his sixth round selection by Carolina in 2007. The free agent options are slim, but should be seen as more beneficial to the Capitals in the future than overpaying to keep Mike Green and limiting future flexibility with a strong farm system still in place in Washington. This is one of the most critical summers for Washington, although that is seemingly the vibe every offseason. Caps’ GM Brian MacLellan has a long list of tasks to complete, but he can’t afford to wait on Green and let other options and avenues close too early.